Sorry for the lack of an update in a while. I had planned to put some new tools up for sale last week, then today, but things came up which prevented me from doing so. Since the first of the year it seems like we have consistently had at least one of our three kids down and out of school with some sort of illness. Today for the first time in weeks all of three were almost healthy and back in school but Mother Nature intervened with an ice storm that forced schools to dismiss early. Drat. So, I’m sitting on a pile of tools ready to sell. I just need the variables to line up properly. I have an update planned for next Monday, Feb 3. I did have a couple of hours free this morning before the kids came home from school. 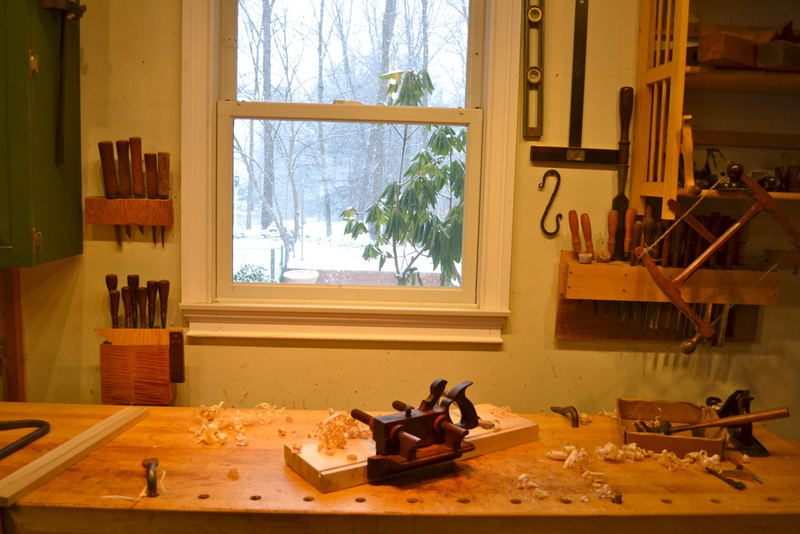 I spent some time in the shop restoring, tuning, and testing a few plow planes while it snowed big fat snowflakes. Sorry for the lack of an update in a while. I had planned to put some new tools up for sale last week, then today, but things came up which prevented me from doing so. Since the first of the year it seems like we have consistently had at least one of our three kids down and out of school with some sort of illness. Today for the first time in weeks all of three were almost healthy and back in school but Mother Nature intervened with an ice storm that forced schools to dismiss early. Drat. So, I’m sitting on a pile of tools ready to sell. I just need the variables to align properly. For now I have an update planned for next Monday, Feb 4.